Connected! ”Connected Diamonds” is the pattern theme of my latest backstrap weaving. It’s not a new piece. It is the same very long silk warp that I started some time ago on which I am slowly inching along. A couple of days ago I celebrated having reached half way and stopped to figure out what I would weave in the very center. I charted a set of six interlocked diamonds in Andean Pebble Weave. They remind me of little ballerinas with their arms linked dancing their way across the warp. Today is not the best day lighting-wise for photography and so I will wait for another time to show them to you. Here is one version of connected diamonds in the first band of patterning right at the start of the piece. 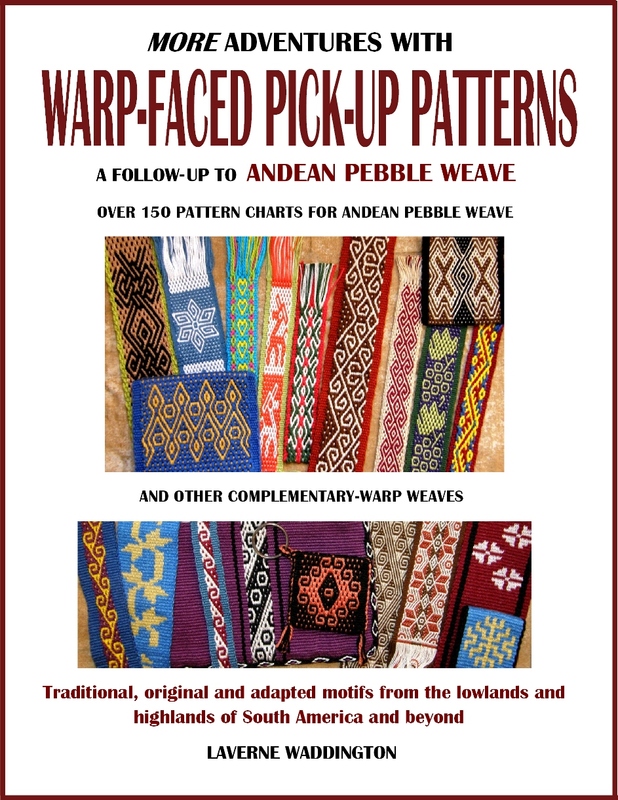 This was done using a reversible 3-color Andean Pebble Weave structure. 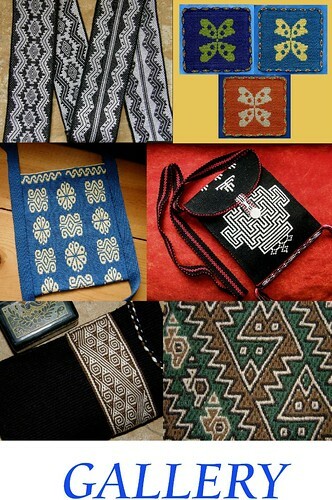 The motifs on the side are woven using silk supplementary weft. 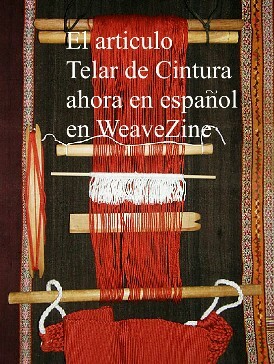 I used a supplementary-weft technique which has the colored weft extending far beyond the limits of the motif, hidden between the layers of warp threads while it travels to the edge of the cloth. There it exits the shed and turns to enter the next shed to create the next row of pattern. You get started weaving warp-faced plain-weave cloth. Then you open a shed, beat and pass the weft. Leave the shed open and drop threads to create spaces, or gaps. Your colored supplementary weft will be exposed in these spaces. Pass the colored supplementary weft in the shed with the spaces. Open the next shed, beat and pass the main weft. Leave the shed open and drop threads according to the next row in your pattern to create spaces, or gaps. Then, pass the colored supplementary-weft. There it is in a nutshell. I have a more detailed free tutorial on this technique here. Now, continuing with my black silk project…I finished off the section of 3-color patterned Andean Pebble Weave with weft twining. 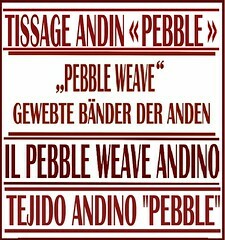 The twining nicely marks the transition from the complex 3-color weave, where 3 colors (gold, brown and red) show all at once, to plain pebble weave. In the plain pebble weave part, colors A and B (gold and brown) show on one face while colors B and C (brown and red) show on the other, Here is some progress on the piece with various versions of connected diamond motifs in pebble weave and supplementary weft. If you look at the smaller gold motifs in supplementary weft on the right hand side of the picture you might notice a difference in their appearance to the one that sits beside the 3-color pebble weave in the first picture of my piece, above. Now they are outlined by what look like little dots. Here I used a different technique where the weft hides under just a few warp ends at the edges of the motif and then turns on the surface of the cloth to return and complete the next row of pattern. The little dots you see are the weft turns and they follow the contour of the motif. I used white supplementary weft to weave the motifs in the band of pattern across the bottom of the red sashes. You can see where the white weft exits and enters the sheds at the very edge of the cloth. Can you see the little white dots along the edge? The small flower patterns were woven using the other technique I described where the turns of the supplementary weft outline each motif. See how the little flower heads are surrounded by white dots. For me, each technique has its charm and its place. You can barely see the weft turns in this fine silk piece. They outline the star motifs. In this case, I didn’t want to carry the gold supplementary weft all the way to the edges of the cloth within the shed as I felt the silk piece would be too heavy with all that additional weft thread in each shed. For me, the outlining technique works best around regular shapes with smooth sides, like triangles and diamonds. I like weaving leaves and curling vines with supplementary weft but those kind of very irregular shapes look much nicer if the weft is carried all the way to the edge of the cloth and turned there. That’s what I did on this piece with its leaf motif. You can see the turns of the white weft along the edge of the cloth. The regular shapes on this piece work well with the turns of the weft outlining the motifs. Because the motifs in this piece are irregular in shape, the supplementary weft travels from edge to edge where it exits one shed ready to enter the next. You can probably just make out the dots of weft along the edge. On the small sample band on the right, I didn’t take the supplementary weft all the way to the edge. I stopped just before the edge at the beige vertical stripe and turned the weft there to camouflage the turns within the stripe. As I said, each technique has its charm and its place. The dots of the weft turns on the edges of the cloth can sometimes look like beads and look very attractive. However, that technique tends to thicken the cloth as the supplementary weft is sandwiched, along with the main weft, within every shed. But, there are times when that kind of bulk is exactly what I want; for example, when I am making a bookmark or a key fob with very fine cotton. I like the way the fine cotton allows me to create patterns with a lot of detail in a small space and I also like the way the supplementary weft, which is sandwiched between the warp layers, gives the cloth more substance. The band needs a bit of sturdiness to perform well as a key fob. If I am weaving a plain-weave piece in fine silk, I don’t want to lose the luscious liquid drape of the cloth by having lots of additional weft stuffed in the sheds. I will choose, in that case, to turn my supplementary weft as close to the motif as possible. This means that I have to think carefully about designing the kind of motif that suits this technique…preferably something regular and smooth-sided. Here I am almost halfway through this silk piece and ready for the dancing diamonds in the center. The folds in the cloth give glimpses of different parts of the patterns. I used red here and there to tie in with the third color in the 3-color pattern at the start. Connected! I am feeling particularly connected to weaving friends around the world this week as my new dvd starts to arrive in various parts of the USA, Canada, Thailand, Australia, England, Germany and South Africa, Thank you all so much for your support! The dvd or streamed option can be found at Taproot Video. Thank you for the encouraging comments on last week’s post. I didn’t get to see the actual disc in its nice case as I had to return to Bolivia immediately after filming. I was able to participate in as much editing as was possible in the evenings after filming but I have not yet seen the final cut with my chapter title pictures, music and various other details added. When I returned to Bolivia, I designed the artwork for the disc and case, took the title pictures and chose the opening, closing and transition music. I sent the artwork off for printing and the music for editing. I love the rhythm of that music! Sometimes I feel my warp is jiggling and dancing along to that rhythm as I weave plain weave….strumming, opening a shed, beating, passing weft… sometimes accompanied by the clacking of sticks. And, you will learn when you watch the video that moving your body is a big part of creating a smooth and rhythmical sequence. 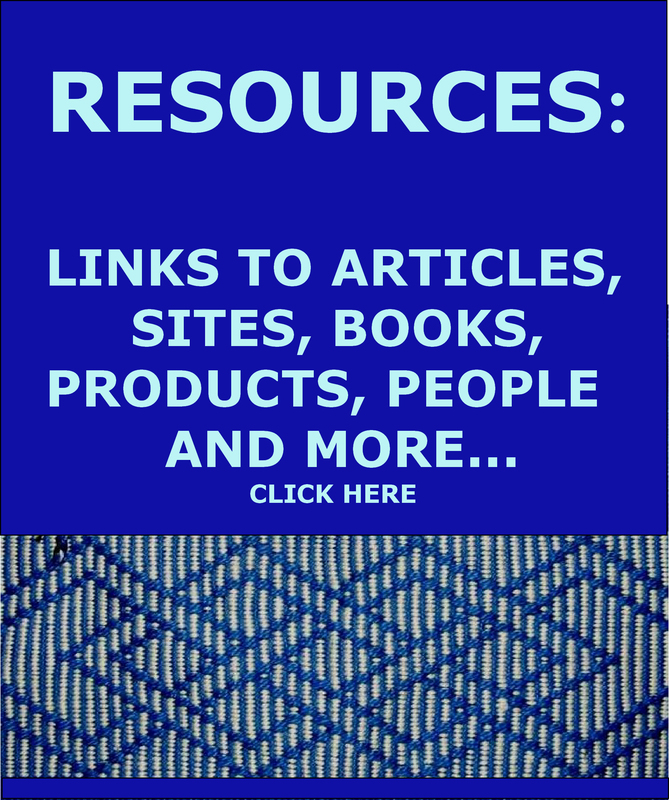 I hope you will indulge me as I link to some of the comments I have been receiving. I really appreciate the efforts people have made to give me feedback. For one sequence, I sat right under the tripod and had to be careful not to move my head forward or bump the tripod as Rainer captured the ”weaver’s view”. A nice close-up showing how I handle the weft for neat edges in warp-faced weaving. Connected! I also felt connected once again to the highland weavers I visited last month as I received some sweet snail mail from them. I posted about that visit to the highlands and the time spent with the weavers here and here. Veronica, Abi, Nelva, Maxima, Dorinda and Justina made Thank-you cards and sent them along. They are really lovely. Veronica was very pleased with her progress on the hook pattern band on the first day. Vero and Abi drawing their Thank-you cards in Dorinda’s lovely garden. Here are two of the cards posed on a couple of the beautiful woven bands made by some of the weavers I met. Maxima and I are winding a warp together in the drawing on the left and then I am shown weaving on the leaning vertical loom in the other (a blob of dark hair! against the yellow wall). Dorinda is shown drinking tea on the stoop and strolling in her garden….sweet! I LOVE all the tones of cochineal in this band. This card is from Dorinda and Justina. These are cards from Nelva and Maxima on more of the beautiful woven cloth. Now I just need to repeat everything I have done so far on the other half of my silk piece. I can’t wait to do the wet finishing and feel it relax and ooze into supple silkiness. 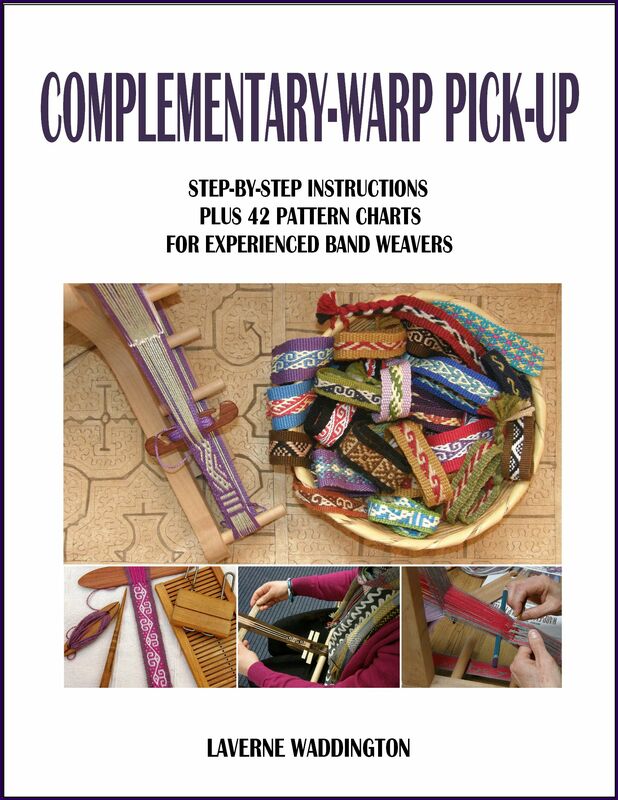 I hope you enjoy the tutorial on supplementary-weft patterning. Many of you will already know it but it might be a nice reminder to give that technique a try. I will leave you with the drawing 12-year old Nelva sent to me. What fun!. She even drew the patterns on my belt. I am holding the sample band that I wove and left for them. Laverne your explanations are so easy to follow and your work is wondrous! Your connected diamonds piece is gorgeous! You do the most amazing work, Laverne! Thank you for sharing with all of us.